Well it has been the type of day you never forget and I mean that in a really good way. This promises to be a long entry, mostly because this is for me and I don’t want to forget it. I guess you could say it kinda all started back in 1999. It was the day before my high school graduation and though it was not altogether unexpected, I received the news that my grandmother had passed away. She had been sick and it was not so much a terrible shock as it was a sense of emptiness of losing someone close to me. We went to her funeral 2 days after I graduated. By that point I had decided I was done with everything related to high school and I didn’t want to think about them anymore. I didn’t even bring my yearbook to get signed– not a single signature in my senior year yearbook. I thought about my grandmother and her funeral and heading off to college and graduation itself was a blur. Fast forward 3 1/2 years. After what remains to be 3 1/2 of the most amazing years of my life spent in Gainesville I graduated on December 21, 2002 in what proved to be a bittersweet (mostly bitter) cold and windy but crystal clear winter day. I recall the exact outfit I was wearing, and the friends I was sitting next to. I remember the stress of moving my remaining possessions home with me after the ceremony ended and I remember many family arguments. I don’t even remember at this point, what they were about. All I know was that after 3 of the happiest years of my life living in a place where I finally felt like I discovered the who I really was, I just remember the stress and the arguing and the going home and feeling completely empty. It felt like I’d just spent all this time finding the true me and then losing it all over again. Every time I went home during college for Christmas or the summer it was always a transition period, a limbo between happiness for being home and longing desperately to go back. It’s not so much that I was a different person in each city. I certainly was not. But just that there is an irreplaceable feeling of pulling off I-75 on Archer Road and driving into town and feeling like anything is possible. That’s the magic, the pull, the addiction of being a college student. And when I left I knew I wasn’t done. I knew one day I’d go back and that it would undoubtedly be at Florida because even though I nearly went to U of Maryland, somehow I always knew I could only be a Gator. And I knew I needed another shot at graduation and having real closure on that chapter of my life. So when I applied for my Master’s degree program, in the back of my mind I knew from the split second I got my acceptance letter that I would attend the final ceremony. I would understand it more fully and appreciate it more deeply. So when the time finally came to graduate I knew this was my last shot at getting it right. And I’ve gotta say that’s a lot of pressure to put on one single event but it was perfect in every way. 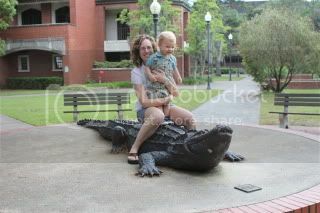 Yesterday we left on our drive to Gainesville. 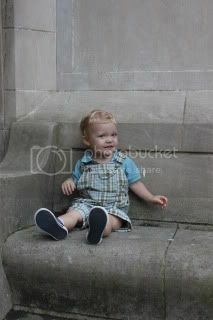 This was to be Andrew’s first visit. I knew when I had him that one day he’d get to visit my former home and I knew that graduation would be the perfect first time. We started at the bookstore. Oh how I wish the new bookstore had been around when I was there on campus. There is an undeniable feeling of academia everywhere on campus but nowhere else do you feel it as much as when you’re surrounded by BOOKS. I had had these anxiety ridden dreams that I would get there and they would have no record of me. I guess that’s part of doing an online degree program. I knew the people really did exist somewhere and it certainly helped that I could recall the buildings and places as well as the basic policies and procedures but the fact remains, until yesterday I never once spoke to a person face to face and so I was a little worried I had somehow made a mistake. There was even a dream once where I imagined it all. It’s not like there is more proof when you physically attend class. No actually I’ve left a digital trail 10 miles long from this program. But sometimes when you don’t deal with people in person you start to disassociate yourself from the whole process. I guess I’m not really explaining this too well. It’s pretty hard to describe. I wonder if any one else who has done this felt this way. I tend to think they have. But worries were needless (as they often are for me). And my cap and gown (and hood!) were ready and waiting. I got my portrait taken and I also had one taken with Andrew and A. Afterall, they were such a huge part of this whole thing. I know all my children will be special and God willing that I have more, I know that Andrew, aside from being my first precious child, will always hold the unique place of being my graduate school baby. He went through this whole thing with me. And in some ways, suffered my stress, my anxiety, my workload right along with me by missing time he could have spent with me had I not been preoccupied with finishing. Today was every bit as much about him as it was me, at least in my mind. So anyway, I got the pictures done and picked up a cap and gown and off we went to visit Century Tower, for those who didn’t know me then, A proposed under Century Tower, on a cold rainy Saturday in February in front of all my friends. It was and remains to be the most amazing surprise, no, the most amazing ANYTHING anyone has ever done for me. So naturally, we had to go there! Then taking a seat on the bench along the side. Then we walked through UMA to the area where the band used to warm up on Game Day before the march to the stadium. We had to wait for 3 girls to get done with their “photo shoot”. I definitely felt a little self-conscious when we were standing there waiting for them because I don’t really look older to most people without any points of comparison but I felt 29 when I’m standing there next to these 22 year olds in cocktail dresses who were most definitely without children. Actually, I guess self-conscious is the wrong word because I felt more proud than anything. Finally it was our turn to take pictures. 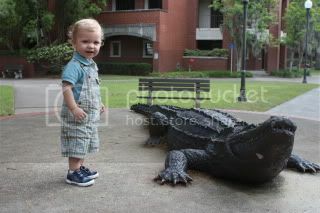 At first Andrew was very tentative around the ah-gee-ya (alligator). It had not occurred to me that he would not understand it was fake. 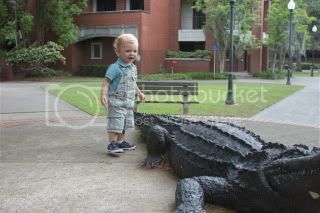 He didn’t cry or fuss like he was scared but he was not in a hurry to touch it either. 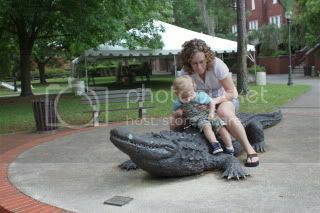 Finally, I convinced him it was okay to touch it and we sat on the Gator which is a pretty generic picture but hey, we needed to have one. 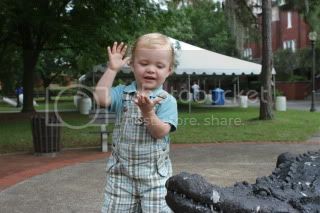 So then I wanted to get a picture of him hugging the gator. Now I can’t really explain why I thought this would be so cute but I wanted the picture. 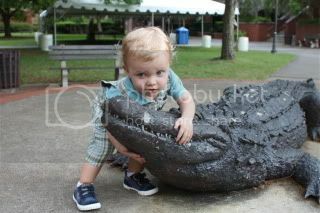 So A decided to show him it was okay to hug the gator. OOooooohhhh my dear child!! 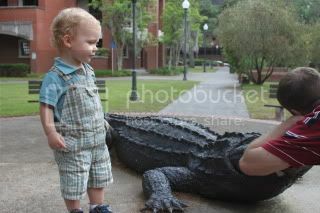 He now thinks the gator was safe to touch because it was sleeping. 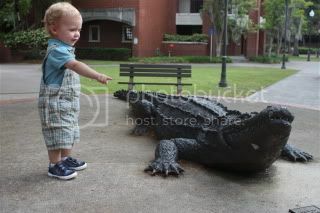 My dear God in heaven, please do not let my child ever come across a living Gator. 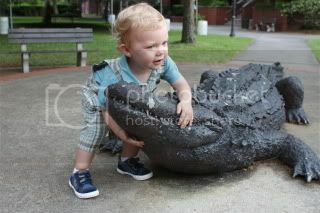 He will undoubtedly rush up to give it a kiss on the snout! 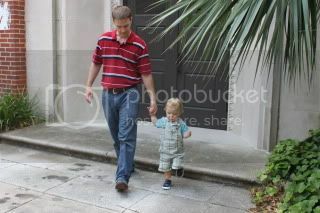 We finished with the pictures, walked back to the car and then went out to dinner. I have got to say, Gainesville has so many more restaurants than it did when I was there. I don’t think I would have been able to survive with that many good places to eat. I was so dirt poor as it was the first time around. We ate at Fridays or Chili’s a lot because that was pretty much all there was. Now there is every restaurant I’ve ever heard of and plenty I haven’t. We picked Carrabba’s for pre-Graduation dinner. Andrew was getting very tired though so we ate fairly quickly and headed back south to Ocala because I waited too long to get a hotel room and they were completely booked solid anywhere near the city. Just as we arrived at the hotel it started to POUR down rain and I do mean pour. We got soaked carrying everything up to the room but when all was said and done the 4 of us (my mom was with us too) got in bed for the evening and I had the sense that I was mere inches away, after having come miles, for this final event. 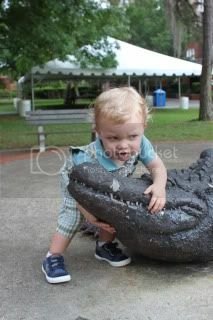 This entry was posted in Andrew, Gators, Life, Teaching by EMB. Bookmark the permalink.